Ceramic chambers are widely used in accelerator units for injection, fast extraction and beam excitation. These alumina chambers are placed in fast pulsed (range of nanoseconds) electromagnets of the kicker, bumper, dumper or scanner application. The reason for applying ceramic chambers is to avoid shielding of a fast changing external magnetic field by metallic chamber walls and to avoid heating, due to eddy currents. To prevent accumulation of static charges and to reduce secondary electron emission on the ceramic surface the internal surface has to be coated by a thin low conductive layer. The requirements for those ceramic chambers are mechanical strength against atmospheric pressure and mechanical forces during handling, assembling and operation. To achieve a precise position and a low gap between the magnets, the chambers have to be ground on the outer surface and on the edges. Due to the complex production process of high performance ceramic, like isostatic pressing of the ceramic powder, green machining, sintering and grinding, some challenges have to be solved. Princeton Scientific Corp. has a long and successful relationship with various ceramic manufactures. Each manufacturer has its specific advantages of the material, such as mechanical strength, brazeability, precision, feasible dimensions and price. Princeton Scientific Corp. chooses the best manufacturer for each specific requirement and provides different hermetic seal brazing techniques like conventional metallization with molybdenum-manganese paste and nickel layer, brazed with silver-copper eutectic filler material as well as active brazing to avoid magnetic materials. 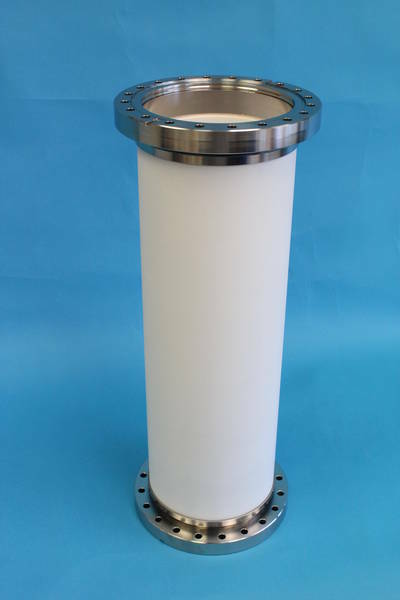 Princeton Scientific Corp. provides a large variety of different transitions between ceramic and CF-flanges and has developed a special and compact connection of non-magnetic metals like titanium, stainless steel (316 LN) and copper. All chambers are bakeable up to 300 °C, cleaned for a low outgassing rate and packed like other sensitive UHV assemblies.